The Struie course at Royal Dornoch started out in the early 1900s as the Ladies Course and this layout, along with part of the Championship course, was taken out of play when the Air Ministry acquired it as the site for an airfield during World War II. When hostilities ended, the Championship course was extended – George Duncan adding holes 6 to 11 – to fashion the modern day links that’s now revered around the golfing world, and six of its former holes (13-18) were appended to three from the old Ladies course to create a new layout. This 9-hole course remained in that format for over half a century until adjacent land by the shores of the Dornoch Firth became available at the end of the 1990s, allowing Donald Steel and Robin Hiseman to expand the Struie layout into a full 18-hole course. Essentially, the 6,265-yard course in play today is configured with the opening two holes and closing hole routed across an area of high ground close to the clubhouse, while the remaining holes occupy the largely level terrain that lies closer to the waters of the Firth. “Gizzen Briggs,” the slightly doglegged 406-yard 5th is rated the most difficult hole on the front nine, whilst “Black Burn,” the 429-yard 14th is the toughest hole on the inward half, playing to a green that’s protected by an intimidating pond to the right side of the putting surface. The Struie redevelopment was born of a desire to elevate the status of the second course, so that the sale of combined course day tickets was a viable option. The old Struie had been tinkered about with by Donald Steel before I became involved, but was still mostly a knockabout course for the locals and not really suitable to attract visitors in large numbers. It was a big thrill to be commissioned by such a great club and the highlight of my career at that time. I really enjoyed working on the scheme and there were good people at the club, with an ambitious vision for the future. With the addition of 300 acres of new land alongside the Dornoch Firth, there was scope to make considerable changes. The first phase of redesign was limited in so much that the course had to start and finish at the existing clubhouse. This limited the incursion onto the new land to just 5 holes, but this was arranged so that further new holes could be added in the future to meet the ultimate objective of creating an entirely new second course. I mapped out these additional holes but sadly, the ambition for this has not yet been realised. The club’s aim was to increase the length and par of the course so that in terms of challenge it was more of an equal with the Championship Course. This involved the five new holes (9 to 13) plus the redesign of a further six holes (3, 4, 5, 6, 14 and 15) within the Struie. Two holes were abandoned completely (the old par 3’s at 4 and 15) in the reorganisation and a further three were converted into a three-hole warm up loop alongside the practice ground. We also took on a radical redesign of the burn that crossed the course. When we arrived it was a straight, wide canal, but we restored it to its original winding course. I don’t think many people realise that was part of the work, but I’m very proud of that part of the project. The style of the new holes was heavily influenced by the natural sand dunes and blow outs found between what are now the 10th and 11th holes. When they were discovered, this area bore comparison to what is found at Kiawah Island. Sadly, the culling of the rabbit population has resulted in the sand blow outs filling in with grasses to a large degree. The new Struie is a good test of golf, but it has never really hung together as a cohesive test, due to the patchwork of design styles and landscapes. There are some great holes out there and some lovely natural contours, but the flat part dissected by roads and alongside the caravan park was short on natural appeal. I had a plan to realign and rebunker holes 16 and 17 which would have added a good strategic twist but never got the opportunity to see it through as the committee structure changed. The five new holes took the Struie to a fantastic location down by the firth and they were good, testing and spacious golf holes, in contrast to some of the tight holes amongst the gorse. I went back to the Struie three or four years ago and was rather upset with what I saw. The new holes have been heavily sanitised with many of the prominent strategic features of the original holes having been removed, along with a handful of beautiful ridge line bunkers. It seemed to me that the ambition for the Struie had diminished when it could easily have been of Skibo quality had the full plan been implemented. We played the Championship course this morning in short sleeves under an azure sky in 15 Celsius, so having finished we were of course ready for more golf ! Lots of people don't seem to realise that if you want you can play the Struie for only GBP15 extra to make a day of it. We raced round in less than 3 hours of great match play golf, with lovely colours down by the firth and huge skeins of geese following us back to the town as the shadows lengthened. Well worth playing along with the big course. We also sampled the second course; The Struie. This 6,265-yard, par 71 layout has seen many changes over the years and caters for all levels of golfer. It has a good start and the newest holes – nine to 13 – are very appealing and along with the fine par-three seventh make it worth playing. However, the remainder of the course is played over relatively flat, uninteresting land albeit with some interesting green complexes at the end of each hole. As many I am a great admirer of the Championship Course at Dornoch and when I travel to Scotland, most of the times I plan my whole trip around that course. So it is kind of surprising, that I never had the feeling, I should play the Struie, too. This time my schedule was much more relaxed and my plans were not even made up before my trip. So, one day, after a nice short hike to the strange Mannie monument near Golspie, which you can see from all over the region and often is a good line of play on the Championship Course, I came to Dornoch to just enjoy the place and the friendly weather. After sitting in front of the clubhouse for a while and watching the usual US tourist groups hacking away, my golfing spirits awoke and I decided to give Struie a try. If only calculating the value for money this would not have been a good decision. Being there in April I had to pay 35 pounds which is exactly the same green fee as I had to pay in Brora two days before. But in my opinion only the great number of exceptional good courses in that area makes it so hard for the Struie. The greens are very good, even in that time of the year. They were very fast and absolutely true. The surrounding after the first few holes is remarkable; the views of the Dornoch Firth and the snowcapped hills in the backdrop are really impressive. I have to confess, that no single hole really stayed in my mind. Perhaps, the 15th, a short Par4 with a stone wall on the left and the town of Dornoch as a backdrop, was a little bit more interesting. So, for sure, the course lacks of greatness. But it is definitely worth a try, when you are staying in the area for some days and you have played the other good ones around already. It is not in the same league as Brora, Tain, Golspie or Fortrose, but not a disappointing course, either. The opening four holes are a pretty gentle start – just hit the ball straight. From the par four 5th, the Struie gets interesting. Whilst the 5th has conifers down the left and gorse on the right, the 6th also has a large pond running beside the fairway which will swallow up any tee shot leaked to the right. The stand out hole is the lovely 10th, a par four of 429 yards which doglegs to the right. There is thick rough blooming with wild flowers for a duffed shot. Along the left are out of bounds stakes and then you are on the beach. 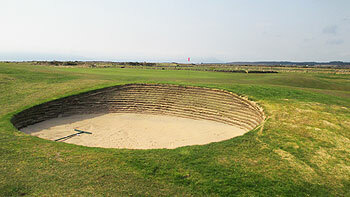 A waste bunker runs nearly the full length of the hole all along the right hand side. Accuracy, not length should be the motto for this course. The 15th is a short par four that invites you to have ago at the green but be careful as out of bounds runs all down the left side. The last hole is a tricky par three over a pond and up a steep hill to a plateau green that slopes away from you and with two pot bunkers at the front. The Struie is more of a challenge than it first appears. You need accuracy from the tee and good ball control approaching into rock hard greens. It is not in the same class, but it represents an excellent warm up for the Championship course. I suspect that very few golfers who come to Royal Dornoch will bother to play the Struie, which is a pity as it’s not a bad wee track in its own right. I played it the other morning as a warm up for the Championship that afternoon and was pleasantly surprised by the firm and fast challenge it presented. Apart from the 1st, 2nd and 18th, the holes are laid out on a rather flat landscape - though the 15th, for some reason, is very rumpled - with fairways from holes 9 to 13 actually raised a little from the level of the surrounding scrubland beside the Dornoch Firth. The putting surfaces and greenside bunkers are by far the best features on the course, with plenty of beautifully contoured greens and deep sand pits to protect par. If I’m honest, the short, uphill par three 18th is an anticlimactic hole to end the round but I can understand why it’s used to bring the course closer to an ending near the starter’s hut. Only three of the eleven par fours measure in excess of 400 yards from the back tees so there’s every chance you’ll be able to play to your handicap – provided you don’t have the same 2-club wind that I had! I’d say the Struie is well worth featuring on this site as a GEM, even though the chances of it ever becoming a nationally ranked course are very slim. Still, every track has its place and I’d compare the course to the likes of the Portland at Royal Troon or the Burnside at Carnoustie, both of which are great support acts for the main event. I agree, stayed herein 2006 with my 10 year old son and we purchased a weekly ticket and we never tired , playing 36 most days, perfect fun course for learning the game , and at the same time offering a very good test of golfing skill for the good player. Up there with Tain, Brora and Golspie.